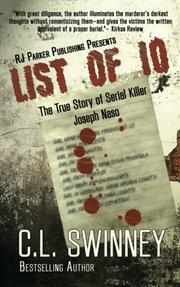 The haunting stories of 10 slain women (4 of whom were never found) constitute this analysis of the hunt for serial killer Joseph Naso. For decades, Naso photographed, raped, and murdered women, leaving no clues until 2010, when a probation officer searched his home and discovered a list of 10 unnamed “girls” whose locations in Northern California matched the crime scenes of several unsolved homicides. Swinney (Monster, 2016, etc.) uses court documents and police reports, letters from the murderer, and interviews with law enforcement and survivors to retrace Naso’s steps, creating a chilling profile of a serial killer and the unfortunate women who crossed his path. The author pegs Naso, a photographer with a wife and children, as a narcissistic misogynist whose sexual urges became increasingly difficult to satisfy until “the massive urge to kill, stemming from an inner perspective to take complete control over a woman, finally overcame him.” Swinney, a police detective, offers sharp insights about the cops who failed to tie Naso to his crimes. When Pamela Parsons was reported missing, asserts Swinney, “the fact the police didn’t look for Pamela is not an indicator of negligence on their behalf…unless a person reported missing is considered endangered or at-risk, police will not search for them.” Since many of Naso’s victims were prostitutes whose deaths provoked little public outrage, Swinney’s compassionate portrayal of their struggles, relationships, and displays of courage tugs at the heartstrings: “As her mind tried to process the John’s home, she again looked at the photographs on the coffee table. Her heart jumped when she recognized one of the girls in the photos.” A collection of photos and a myth-busting chapter on the connection between Naso and the Alphabet Killer in Rochester, New York, round out this thorough, humanizing dissection of the case. With great diligence, the author illuminates the murderer’s darkest thoughts without romanticizing them—and gives the victims the written equivalent of a proper burial.